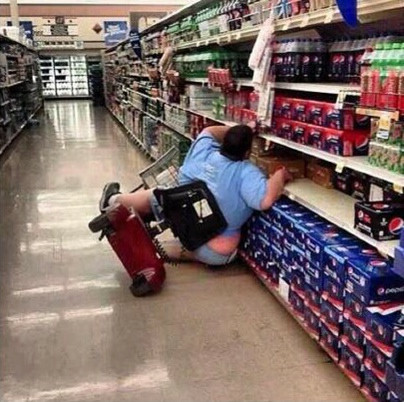 Four years ago a Walmart shopper snapped this photo of Jennifer Knapp Wilkinson in a precarious situation. Where she might have needed a hand, she instead became featured in a mean-spirited meme that went viral. Then she became the target of fat-shaming online trolls. Now, she’s speaking out about the humiliating experience. She posted a very personal and honest post on Quora. According to the Daily Mail‘s interview with Knapp Wilkinson, she learned about the photo when her sister found it and asked if it was her. The Missouri woman then scrolled through the often vicious comments that made fun of her obesity. She said her parents had the same disease and both underwent surgery in their 30s. She fears her children might be susceptible to getting the spine disease, too. She says she now uses the photo as a reminder of a low point in her life. “You can not see my disabilities but they are there and they are real,” she said. “So next time you see photos making fun of people just remember you know nothing about these people or the struggles they face everyday.